The reverse-osmosis process works by forcing water under pressure through a special synthetic material called semipermeable membrane. This membrane attracts water molecules and repels dissolved impurities, including bacteria and viruses, even those smaller than the water molecules themselves. Clean water is one of the most important needs of our bodies. According to research articles and news we have reached a point that all sources of our drinking water, including municipal water systems, wells, lakes, rivers, and even glaciers, contain contaminants ranging from naturally-occurring minerals to man-made chemicals and by-products. While many contaminants are found at levels not enough not to cause immediate discomfort or sicknesses, it is proven that even low-level exposure to many common contaminants will, over time, cause severe illness including liver damage, cancer, and other serious ailments. Even the chemicals commonly used to treat municipal water supplies such as chlorine and fluoride are toxic and are known to have significant adverse effects on the human body. Purestream includes both a 3 and 4 stage reverse osmosos. The following below details how a 4 Stage works. NB: Our 3 stage has the carbon pre-filter only, as the pure water leaving the membrane is *NOT* stored in a tank vessel, rather it is consumed immediately, and the. The purifying process begins with a 1 micron cartridge that traps dirt, rust, mud, hair as that can affect the taste and appearance of water, whilst protecting the RO membrane from fouling and abrasion. 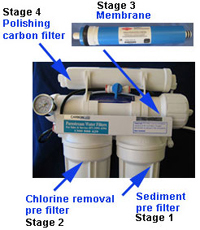 Carbon pre-filter stage includes a 10 micron chemical removal cartridge to ensure no chemical deterioration of membrane from residual chlorine. Maintaing a good pressure flow rate is crucial for the correct preformacne of the following reverse osmosis mebrane, hence the use of a 10 micron (absolute rating) pre filter. This is the primary component of `Purestream' RO purifiers and features the latest technology Dow Filmtec TFC membrane that can separate up to 98-99% of dissolved metals and minerals from ordinary tap water. Purestream RO membranes are capable of rejecting ionic contaminants down to five angstroms in size (One angstrom is one ten millionth the size of a millimetre). Final 'polishing' and reduction of any potential residual VOC's (volatile organic contaminants). While the RO process will reject incredibly small contaminants, it must at the same time be sufficiently permeable to allow hydrogen and oxygen to pass through. As a result, some gaseous and low molecular weight chemicals and cancer causing compounds such as chloroform may pass through the membrane. These potentially dangerous contaminants are effectively reduced by the Purestream chemical reduction and water polishing final filter carbon cartridge. this riosk is extremelly low, however, given the wpure wtaer is sotred in a storage tank for an unlimited period of time, it makes good sense to eliminate any possible risk of further contimination by running the wtaer through a 'post-filteration' process.